County Commissioner Tom Bowman announced his resignation Tuesday, drawing an end to nearly eight years of service on the three-person board. Bowman said in an interview with the Express that he is leaving to become chief executive officer of Sentinel Fire and Security, in charge of operations and development. Bowman sold his private company, Ketchum Alarm, to Sentinel in 1999. Bowman worked for Sentinel as part of that sale from 1999 until 2001. 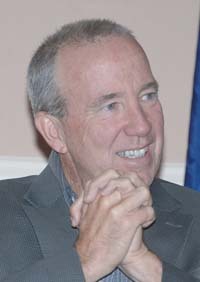 He became a county commissioner in January 2005. "I think I'm going out on a good note," he said. "I'd rather go out with people saying, 'I wish he would stay,' instead of, 'He's been there too long.'" The Blaine County Democrats now have until Oct. 4, the effective date of Bowman's resignation, to pick three candidates from a panel of interested Democrats. Those three will then be presented to Gov. Butch Otter, who will appoint one person to fill Bowman's seat. The board has not seen a resignation since 2008, when then-Commissioner Sarah Michael stepped down from her seat to embark on a 10-month odyssey through the Himalayas in Nepal. Michael was replaced by Commissioner Angenie McCleary, who was appointed by Otter and who won the seat by election in 2010. McCleary's appointment was the last time the board saw a new member, and Bowman said he feels the time has come for some turnover in county government. "No one is irreplaceable," he said. "New blood is always healthy for an organization, and hopefully there are many very capable people in the community willing to serve." Gini Ballou, chair of the Blaine County Democrats, said the party will be looking for someone who is fair-minded with Democratic values to serve in Bowman's place. "Blaine County has a lot of talented people," she said. The appointee would serve the remainder of Bowman's term—just over two years—representing the central part of Blaine County. Commissioner Larry Schoen said in an interview Tuesday that he helped work with the governor's office in 2008 to find a suitable replacement for Michael, and expects to play the same role this year. "Personally, I hope for a candidate with leadership experience who is able to handle a multitude of complex issues," he said. "It is more than a full-time job." Bowman said the job opportunity came about last winter, when he met the owner of Sentinel, Henry Nicolai, in line at Atkinsons' Market. Nicolai, who has run the company since 1989, asked Bowman if he would be interested in a job. He said he signed a five-year contract Friday. Bowman said that while the negotiations were ongoing throughout the early part of this year, the job offer did not factor into any of his decision-making—including a dissenting vote on the county's tentative budget last week, which he voted against due to the inclusion of planned raises for county employees and elected officials. Bowman served on the Ketchum and Sun Valley fire departments starting in 1984. He served on the Ketchum Fire Department until 2001, when he moved to Hawaii, and rejoined briefly when he returned to the valley in 2003. He resigned from the department in 2005 when he joined the board, which also makes decisions as the Blaine County Ambulance District and contracts with the Ketchum Fire Department for ambulance services. Bowman also served on the Blaine County Planning and Zoning Commission from 1991-2001. "I think everyone owes the community some level of public service," he said. "This is the way I chose to do mine." Among his proudest accomplishments, he said, was aiding efforts to fight the Castle Rock Fire in 2007, which burned nearly 50,000 acres near Ketchum but did not destroy a single house. Bowman said he was not involved in an active firefight, but served as a liaison among the Forest Service, the BLM and other officials. Bowman also leapt into the land-use fray when elected in 2005, overseeing a process that rewrote Blaine County planning and zoning code to eliminate development rights on many hillsides and rural areas of the county. Bowman said that at the time, the county was booming and the commissioners were concerned that high-density housing could stress the county's infrastructure. Commissioner Angenie McCleary was on vacation and unavailable for comment Tuesday, but Schoen said Bowman's resignation would cause a big transition period for the board as it attempts to adjust to a new member. "I will miss Tom a great deal," he said. "We've had our differences in opinion, but that's what makes for a good, strong board." People interested in applying for the District 2 County Commission seat should submit a letter of interest to Gini Ballou, chair of the Blaine County Democratic Party. Letters should be sent to ballou2350@msn.com. The county Democratic Party will select three names from the applications and send them to Idaho Gov. Butch Otter for a final decision. People sending a letter of interest should state why they're interested, their education and experience, ideas about the future of the county, participation in the Democratic Party and county issues, and location of residence. Candidates must live in the district, which stretches from south of the East Fork River to the north side of Fox Acres Road in Hailey. The County Commission seat is a full-time position with meetings each Tuesday except for the fifth Tuesday of each month. It pays about $55,000 per year plus benefits, though a raise is possible pending committee review this month. For questions about the nature of the position, contact Angenie McCleary, Tom Bowman or Larry Schoen at 788-5500. Other questions should be directed to Gini Ballou at 720-4347.